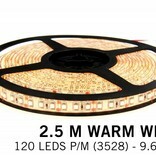 Warm Wit LED strip 120 leds p.m. - 2,5 m. - type 3528 - 12V - 9,6W p.m. Warm White LED strip with 300 extremely bright type 3582 LED's. A-Class LEDs with a total output of 48 watts. Ideal for softer cove, bookshelves or detail lighting. Color temperature of 3000K, IP65 splash proof, 12 Volt. LED strip Warm White (WW). Optimal lightspread thanks to the 300 warm white type 3528 LEDs that are closely placed together (120 LEDs pm!). The WW LED strip has color temperature of 3000K, similar to a normal light bulb and thus emittes a beautiful, pleasant warm white light. Perfect for behind frosted glass, in bookcases, cove lighting, staircase accents and more. Thanks to the splash proof coating, this warm white LED strip is also suitable as a light source above the kitchen counter or in the bathroom. We constantly invest in research for the best and brightest warm white LED strips for a competitive price. This will be noticed in the high light output and durability of this product. 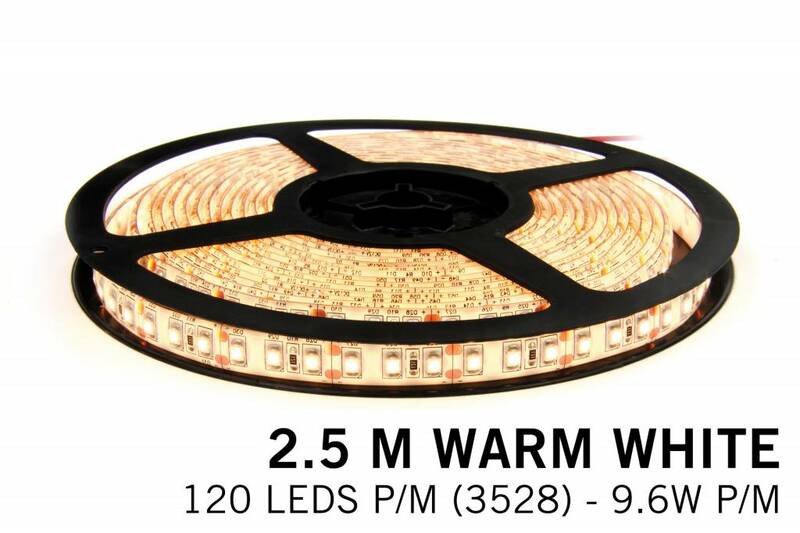 • 2,5 meter LED strip with 300 warm white LEDs, 120 type 3528 leds p.m.
• 12V / 48W / 4A / 9.6W p.m.
For main lighting or places where higher brightness is required: See our 300 LED type 5050 warm white LED strip with 72Watts power.